On June 10th, 2012, a single specimen of the ant-associated Hister Beetle Haeterius ferrugineus was found at night in the nest of the slave maker ant Formica sanguinea in the Kidderminster area. This small (1.5-2.0 mm long) Hister Beetle, which is classed as being extremely rare, was last recorded on the Isle of Wight in 1920. Description: Very small, about 2mm long, oval, bright orange-red in appearance with beautifully sculptured appendages and pronotal edges (Fig.1.). Habitat description: Generally in the ant nests of Formica sanguinea and Formica fusca. In this case under a piece of oak wood in an open, sandy grassland terrain on a slightly south-facing slope. 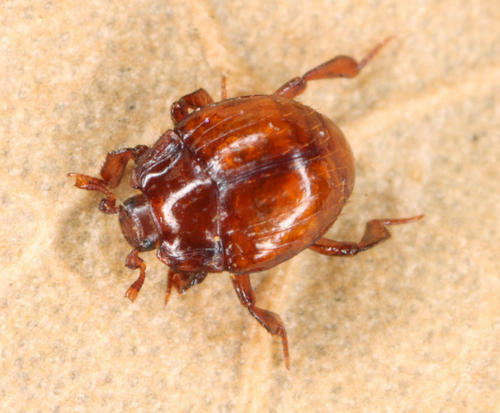 The beetle itself was observed moving in and out of a small section of white-rot fungus attached to the underside of the wood close to the ants’ larval chamber. A second ant specimen taken from the nest was identified as Lasius brunneus (the Tree Ant) but this may have been an accidental occurrence and will need further investigation before confirmation can be ascertained. The site is largely undisturbed and sun-exposed with a warm micro-climate which is perfect for the ants which is there in abundance. History: Notes from Donisthorpe (1927). Habits: This species is much more common on the continent than it is with us and is also found with far more species of ants. According to Donisthorpe (1927) it has been kept in captivity by Wasmann, Janet and others. Wasmann kept specimens alive in these nests for between 2-4 years and noticed their copulation, treatment by hosts, etc. The larvae are still unknown. The ants frequently lick the beetle, carry it about and play with it, sometimes very roughly. The beetle itself feeds on dead and wounded ants, ant larvae, pupae, and mites etc. Both Wasmann and Viehmeyer once saw the beetle being fed by its hosts although this was a very exceptional instance. A second sighting of Haeterius ferrugineus in Worcestershire? Two months after the initial find, on the night of 15th August 2012 I was busy doing a night hunt for Silpha beetles in the same area of grassland where I had seen the original Haeterius ferrugineus beetle. I ended up back at the same piece of wood and decided out of curiosity to have another look. The Formica sanguinea nest was larger than I had remembered it, with a large pile of pupa in the centre. For a few seconds I saw nothing but ants, but then from beneath the pupae I caught sight of the familiar orange-red glint of a Hister Beetle. Then from under more pupae another appeared and another, four all told. I couldn’t believe my luck. I waited until both Hister Beetles and ants had withdrawn deeper into the ground and then carefully re-laid the wood and left them to it. The site itself I have decided to keep secret but there is no reason not to believe that this species may exist in other sandy grassland sites around Kidderminster and perhaps also around the Wyre Forest where large colonies of the ant have been recorded. Could the beetle itself be under-recorded? Possibly, as all subterranean species are difficult to find and one relies to some degree of good fortune. Perhaps by laying out pieces of wood in suitable locations the species could be found more often, as the ant involved does seem to like building nests against decaying wood. I have also found the ant under Limestone slabs too, so possibly suggesting another way of finding the beetle without causing too much disruption to the ants nest. Acknowledgements: Special thanks should go to Cristoph Benisch who kindly allowed me to use a photo from his excellent Coleoptera website www.kerbtier.de. Also thanks to Rosemary Winnall for supplying the literature from Donisthorpe (1927). Editor’s Note: Genus name formerly spelt Hetaerius. The species is extremely rare or unrecorded: ‘Very local in S England (S Hampshire, Isle of Wight, Surrey and Middlesex); Rare’. (Duff 2012). Benisch, Christoph. 2007-2012 www.kerbtier.de. The beetle fauna of Germany. Donisthorpe, H. St. J. K. 1927 The guests of British ants, their habits and life-histories. Routledge, London. Duff, A.G. 2012. Beetles of Britain and Ireland. Volume 1. Duff:West Runton, Norfolk. Fig. 1. Haeterius ferrugineus Picture copyright Christoph Benisch www.kerbtier.de.